I look at the clock. It’s 4:35 am. I can’t sleep. I begin another chapter in the book I’m reading. I go into the kitchen and eat a cracker. I sip some Tonic Water (it helps my leg cramps). I go back to bed. I can’t sleep. I take a little pill. Sleep isn’t coming to me tonight. Sleep evades me almost every night. It’s been that way since I was a child. “What do you think your missing?” my mother would say. I had no answer. I look out of our bedroom window and see our Limelight Hydrangea plant. In the pre-dawn light, it looks unearthly bright…like I left the car lights on. Or that small moons have dipped into our front yard. Or is it possible that I had indeed fallen asleep, slept through the rest of the summer…through fall and now I’m waking up to a new and substantial snowfall? It’s dawn now and I still can’t sleep. Then I remember something. Two days ago, Mariam got me to open the door to the attic. Not so easy in this house. She wanted to do some gleaning of our stuff. We are trying to “de-thing” ourselves. She said she found a box of NYC books. I told her I didn’t want to go through those books right now. Who knows, we may move back to the City in the not-so-distant future. I might want those books then. When she got back down from the pull-down ladder, she said there was plenty of my “stuff” up there in boxes. I asked her what she saw. She said there was the tree clock. I asked her to repeat. She said: “You know, the clock that your father made from the tree”. I’m still awake and now thinking about the clock that my father made…for me. I grew up in Owego, New York. We were blessed with a large back-yard. There were enormous evergreen trees just beyond the lawn where my swing set was located. In between those two tall coniferous trees was a small Birch. Its trunk was only a few inches in diameter. One day, my father rounded up his four sons. He had us sit in front of the Birch tree. I’m on the right and look impish. Is that a sling-shot in my back pocket? Over the years, my brothers and I recreated our positions in front of the growing Birch. We were all growing up. The final posed photograph was taken on a lovely spring day in 1992. We were holding a wake for my mother who had passed away on Easter Sunday morning. Soon after that, the Birch caught a tree infection. It died. My father was left with no choice. It had to be chain-sawed down. I was in Owego that weekend. I asked him for a small section of the tree. He cut it down. He cut it up into sections. I wonder how he felt when he touched the chainsaw to the tree. It must have broken his heart. It breaks mine just contemplating it. He loved his sons so very much. Did he cry? He never would have shown it. But I would have been in tears hoping that my watery eyes could still keep the saw on track. I left for my own home without the tree section. Six months later, my father presented me with the piece of the tree. He had cut open one side and inserted a clock mechanism. On the other side, he attached the hands of a clock. He glued the hour numbers and attached a hook. Since then I’ve moved many times. The clock always came with me, but over time, the numerals fell off. That afternoon, after my sleepless night, I retrieved the clock from the attic. I wondered what thoughts my father had when he cut the tree into pieces. 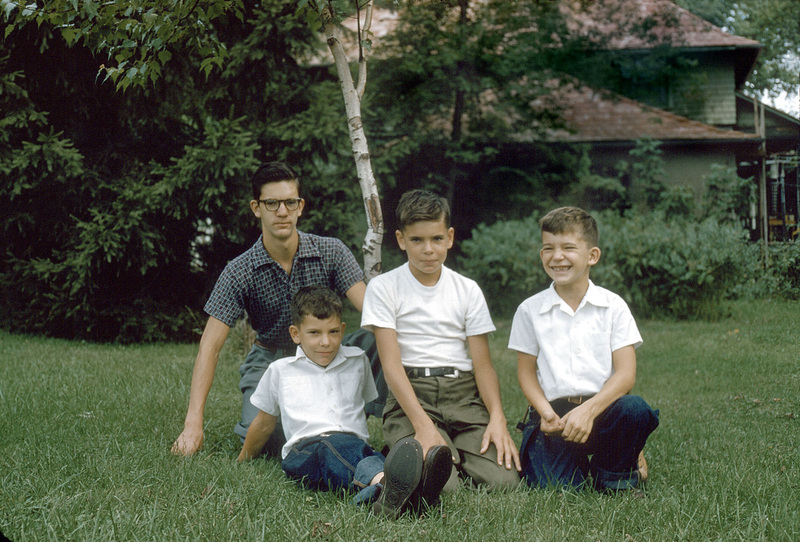 So many decades have passed since he had his four boys take up a pose in front of the tree. I hold the clock in my hands. It’s all I have left of those four photo sessions. I run my fingers over the varnished clock face. I count the rings and calculate the ring that grew the year of the first photo. Two of my brothers are gone now, as is my father. I hold the Birch Clock in my hands. These memories make me sad. I pray that I will sleep a dreamless sleep tonight. A man and woman have four children–two boys and two girls. The same seed…the same egg. One boy grows up, attends college and eventually becomes a doctor and later joins Doctors Without Borders. His brother sits in a small cell at the Clinton Correctional Facility in Dannemora, NY. He did something unspeakable to an eleven year old girl. He has tats that identify him as a member of a gang based in Albany. Many of his friends sit in similar cells–in similar jails–in three different states. One of girls grows up and after sampling life in an New England college decides to join a cloistered convent and eventually will take a vow of silence and chastity. Her sister walks the streets of the Lower East Side of Manhattan. Anyone can buy her love and affection for $50. She has several dozen needle marks on her arms and thighs. The same seed…the same egg. Two trees started life in a forgotten corner of the Adirondack forest. They are rooted only nine inches apart. Perhaps both from the same white pine that dropped its seed-laden cone seven years ago. Now, one tree has added three inches of new growth to its needles in the Spring of 2016. The other tree, a brother?…a sister? has turned completely brown. It will not be utilizing photosynthesis again, ever. It is the only dead tree in this small part of the forest. Why does one living entity flourish and the other, linked by a genetic code, lose the spark of life? Didn’t the alluring Cinderella have several despicable sisters? Jeffery Dahmer had a sibling. Cain and Abel were brothers. Seventeen years ago today, my older brother Denny, passed away. It was not a sudden unexpected death but a slow decline with cancer. His family misses him terribly. My brother, Dan and I miss him. I think about him a great deal. We were a family of four boys. Denny was the second oldest, born in 1942, he was a five-year-old when my mother brought me home, wrapped in blankets…a few days old. The 1990’s were a bad year for our family. I lost Chris, the eldest in ’95 and then Denny in ’98. Now, only Dan, the third born and I are all that remains of that interesting family that lived on the corner in Owego. Everyone who has siblings is aware that each child has a distinct personality of his or her own. That was certainly true of the Egans. Chris was always the science guy. Too many pens in his pocket. Too many rocks or fossils filling his pockets. He went on into academia. 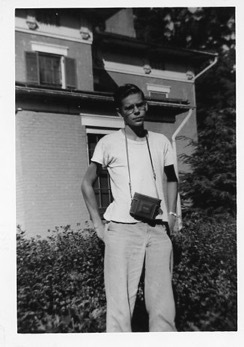 Dan, as a teenager, was into cars and model rockets. I spent most of my energy in a world of dreams and fantasies of writing while struggling to keep up with being like Chris. Denny was different. He was the quiet one. He didn’t like to be the center of attention, but when you spoke with him, he had a sharp wit and sensitivity that most people lacked. To my knowledge, he never got into a fight or did anything destructive. As an older teenager, he befriended a guy named Bob. We all knew that Bob was gay (or queer as we would have put it then). Denny knew it. But my brother was probably the only friend Bob ever had. There was an introspective nature about Denny that set him apart from the rest of us. He loved baseball and he followed the Mets from New York to Houston when he was transferred by his company, Shell Oil. He named his son after Tom Seaver. He would spend hours in his room playing a board game that involved shaking dice in a can to determine the way a play would go. I recall the game was called APBA baseball. There’s probably a video version of it around now. But I can still hear the rattle of those dice in the can to this day. In fact, every time dice are thrown, I think of Denny. He kept meticulous records of players and teams in a smart neat notebook. He wrote the stats in a perfect format. It’s no wonder he went on to become an accountant. Denny never made a big deal of being a Catholic as I recall. He was an altar boy, as we all were. But he kept his God to himself. He was like me in one way, however. He seemed always conscious of death; it held a morbid and fearful power over him. There was a story that one of his childhood friends died as a young teen. The funeral was held at the family’s house. I think I remember Denny telling me that the boy’s mother pushed him forward to the casket and made him kiss the boy’s forehead. Maybe it was an unexpected memory. Denny was also the only one of our family who saw two ghosts in our house. The details aren’t important here. But, over the years, I asked him about those sightings and he never wavered in his description of what he saw. He believed it. I was amazed at his calm attitude. Me, I was in tears nearly every day until I got the dreaded phone call on that dreaded day in June of 1998. Just yesterday I picked up a sachet of balsam that is a common tourist item in the Adirondacks. I put it to my nose and the balsam scent filled my mind of memories of camping as a family here in the Park…in the long ago days of the 1950’s. I never think of Denny as a camper, but as a child, he loved the sand and the swimming and that balsam odor that permeated the summer forest of Golden Beach and Eighth Lake Campgrounds. I have that sack of balsam beside me now. I can smell the 1950’s, my cot, our tent, Chris’ canoe, and the sand on my feet. Oddly enough, I smell a memory of Denny…the demons he carried around inside himself for decades…and I think he would love to sit with me on a beach once again. We would tell ghost stories and roast marshmallows. Strange how powerful an unexpected memory can be. Rest in Peace, Denny, God knows you deserve it.